We’d love your help. Let us know what’s wrong with this preview of Recovery by J.M. Dillard. The Long Awaited Final Book In The Lost Years Saga! It began with The Lost Years: the story of what happened to Captain Kirk and the legendary crew of the U.S.S Enterprise when their original five-year mission ended. The saga continued in A Flag Full Of Stars and Traitor Winds. Now, in Recovery, J.M. Dillard brings to an end one of the most exciting chapters in STAR TREK hi The Long Awaited Final Book In The Lost Years Saga! To ask other readers questions about Recovery, please sign up. Recovery by J.M. Dillard is the fourth and final novel in The Lost Years Saga. The novel is still set in the period before the launch of the Enterprise 1701-A and Kirk is finally coming to the end of his tether in regards to being a desk bound Admiral but before he can lay down his ultimatum to Admiral Nogura he is given the assignment to oversee the final trial/simulation of the USS Recovery a fully automated rescue ship capable of beaming ships and buildings intact and providing state of the a Recovery by J.M. Dillard is the fourth and final novel in The Lost Years Saga. The novel is still set in the period before the launch of the Enterprise 1701-A and Kirk is finally coming to the end of his tether in regards to being a desk bound Admiral but before he can lay down his ultimatum to Admiral Nogura he is given the assignment to oversee the final trial/simulation of the USS Recovery a fully automated rescue ship capable of beaming ships and buildings intact and providing state of the art medical care all in a high warp capable and armed vessel. Admiral Kirk himself was fairly negative towards the concept when it originally crossed his desk but his recommendations have been taken by the designers and the ship is ready. McCoy a civilian and still estranged from Kirk and Starfleet is approached to be an observer onboard Recovery during the simulation and is delighted to see the ship in action, he is impressed with the level of medical technology onboard. The mission for Recovery is to "rescue" the facility on Zotos 4 which includes all personnel and the structures themselves and the Klingons, Tholians and Romulans have been invited to observe as this area of space is in some minor dispute. The USS Starhawk and USS Paladin are going along to provide the "conflict" part of the trial for Recovery but after Kirk throws some curveballs at the ship to really push her programming things begin to break down as she targets all ships as enemies and fires on the two Starfleet ships and invited warships. The Recovery then warps towards the Tholian area of space with the heavily damaged USS Paladin with Admiral Kirk on board in pursuit and McCoy wishing he had stayed at home. This story starts off a little slow and with a problem that has been unresolved through all four of the Lost Years books. What is that problem you might ask? It is that James T. Kirk should never have accepted a promotion to Admiral. His talents are wasted at a desk and he is terribly unhappy with what he is doing. This is Star Trek after all where everyone is doing what they are best at doing. Mr Riley finally comes to terms with what he wants to do with the rest of his life. There is a later bo This story starts off a little slow and with a problem that has been unresolved through all four of the Lost Years books. What is that problem you might ask? It is that James T. Kirk should never have accepted a promotion to Admiral. His talents are wasted at a desk and he is terribly unhappy with what he is doing. This is Star Trek after all where everyone is doing what they are best at doing. Mr Riley finally comes to terms with what he wants to do with the rest of his life. There is a later book, PROBE, that covers the change in careers. McCoy is still retired from Starfleet and is determined to never return unless he is drafted. Most of us know what happens next with him. Spock is in the final stages of Kolinahr. He is having trouble purging his connection with Kirk and McCoy. There is also another entity that is just out of reach that is trying to get in touch with him. Kirk ends up having to take command of the ship is visiting during a demonstration of a ship that recover large numbers of people in a planetary evacuation, Recovery. As with so many of the Star Trek books the demonstration goes terribly wrong and it is all cause by an old enemy that has been invited to watch the demonstration. It was a surprise to me that this enemy appeared so far from that home space, especially when the are so xenophobic and protective of the space and identity. I originally read The Lost Years in junior high or so but never managed to get around to reading the third and fourth book of the series. Of the three followup books, this is probably my favorite. It made me think that JM Dillard should have penned all four books in the series, as opposed to the first and last. The other books are entertaining but Dillard's installments are the ones that seem most invested in the overall premise - drawing a connective thread between the end of the tv series and I originally read The Lost Years in junior high or so but never managed to get around to reading the third and fourth book of the series. Of the three followup books, this is probably my favorite. It made me think that JM Dillard should have penned all four books in the series, as opposed to the first and last. The other books are entertaining but Dillard's installments are the ones that seem most invested in the overall premise - drawing a connective thread between the end of the tv series and the start of the movies. I felt at times that this was meant as a direct followup to the first book while ignoring events in the other two. This felt particularly strong whenever the subject of Kirk and McCoy's relationship come up. The book implies pretty strongly that the two hadn't seen or spoken to each other since the first book but they were both involved in events in the book previous to this one. At times throughout Recovery, the continuity doesn't seem quite right. Still, this was pretty entertaining. I thought Dillard left the book at a nice point, shortly before The Motion Picture starts, although you're left having to connect some of the dots yourself. She provides some interesting back story for a few characters who are killed off early in the Motion Picture and leaves us with a possible explanation as to how Kirk is able to convince Starfleet into giving him back command of the Enterprise. Recovery is difficult to rate for me. There’s a lot to like about it on hand, but on the other hand it’s often enough the same that made me at times dislike the story. On the plus side I would put the fact that Recovery is firmly build around one of the classic episodes (“The Ultimate Computer”), constantly referred to as The Daystrom incident. But here’s also already my first problem with the way Dillard tells the story, as much as I otherwise enjoyed the way the author constantly drops little bo Recovery is difficult to rate for me. On the plus side I would put the fact that Recovery is firmly build around one of the classic episodes (“The Ultimate Computer”), constantly referred to as The Daystrom incident. But here’s also already my first problem with the way Dillard tells the story, as much as I otherwise enjoyed the way the author constantly drops little bonbons for Trekkies by referencing bits and pieces from the classic series, in this case it’s highly annoying to have to constantly read about something I wouldn’t have had much of a clue where to put, much less what the back story here is, if it wasn’t for the fact that I happen to go through a re-run of the series at the time. Another important episode the book refers to is “The Tholian Web”, but unlike the former named, Dillard here takes the time to explain at appropriate points what went on in that episode. Further to point out is Dillard’s way of rehashing information over and over again, changing viewpoints are often introduced by recapitulating things we already know, we’ve already “seen” through the eyes of a different character, adding nothing new. Kirk is increasingly troubled by being earth bound due to his promotion to Admiral, we get it, and Sonak, the Vulcan science officer on board the Paladin reminds him of his old friend Spock, we get that too, there’s no need to reiterate it in every chapter. Same as with the way Dillard uses “The Ultimate Computer”, I’m torn about the way Kirk is getting characterised: on one side we get to see him as the old warrior, prejudiced to new ideas and unable to think of Klingons and Romulans as anything other than enemies, but a man that thrives on action. That’s very close to the idea Roddenberry himself gave. Yet, put under pressure this Kirk still finds the time to futilely long for Spock when the situation calls for quick responses (not to mention go on and on about how he misses space). This Kirk on the verge of a nervous breakdown, felt honestly annoying after a while. Speaking of Spock, he happens to appear in the book in a role that has no the least bearing on the story, it’s as if he was just written in to appease fans. A last, but minor problem I had with the novel is the unfortunate similarity of the dilemma Kirk has to face here, namely to lead a ship full of trainees into battle against an enemy bearing a personal grudge against him, to the one he would have to face in “The Wrath of Khan” which would chronologically follow after it. Thankfully, this book was as good as I remembered. Taking place after Kirk was made Admiral, there are a lot of original characters, and it's mostly about Kirk and McCoy. There's also a little bit of Spock, who apparently signed up to absolve the "Kolinahr", and Sarek also makes an appearance. The original characters were a small problem for me, because... Well, it just wasn't the usual Enterprise crew. I knew that before, of course, but I hoped that the others would at least be mentioned, but no such luck. It really revolves a lot around the new characters and I just didn't find them that interesting. More Kirk and McCoy would've been great. The last book in the Lost Years series is definitely the worst of the four. We get a book that- unlike it's predecessors- doesn't use the potential of the characters being out of a starship and in their own separate lives and situations. The plot of "Recovery" might as well have been used for any regular TOS novel. I was also bothered some continuity questions that the book raises by introducing a 100% automated "hospital-ship", that would be a technological marvel even in the era of Enterprise-E The last book in the Lost Years series is definitely the worst of the four. We get a book that- unlike it's predecessors- doesn't use the potential of the characters being out of a starship and in their own separate lives and situations. 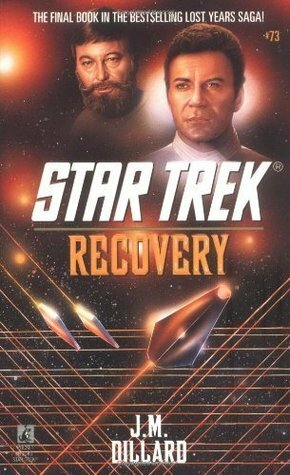 The plot of "Recovery" might as well have been used for any regular TOS novel. I was also bothered some continuity questions that the book raises by introducing a 100% automated "hospital-ship", that would be a technological marvel even in the era of Enterprise-E and Voyager in the 24th ceuntury. The story is kind of tedious and predicteble, beyond saving by the good writing of Jean Mary Dillard who has written so much better books in her career that it's a real surprise to find her ending the series like this. The book isn't really closely related to the other books of the series, actually, which in intself is disappointing. Why write a mediocre standallone when you're closing a series? The plot expands on the Tholian race as an enemy of the UFP, and overall the plot works fine. The primary weakness for this book is the 'uber-ship' itself (AKA USS Recovery). To me it's beyond any stretch of imagination that such a massive ship (which is easily the size of a starbase) could exist in the time period the book is set, let alone be an un-manned vessel and completely computer-run. Four books span the time gap between the end of the original series and the first movie. This is the 4th book. Another fine effort by J.M. Dillard.